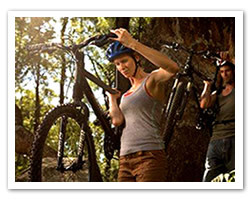 Mountain biking reigns in Costa Rica due to the abundance of dirt roads. There are paved roads that can cater to the most demanding cyclist, but the dirt roads are far more plentiful and fun to investigate. Many are very steep, and will require low gears. Runners will find the dirt roads challenging, and miles of beaches are readily available for interval training. Mar y Selva Ecolodge has mountain bikes and helmets for rent and we can help you with trails and planned outings or training of groups. Tours of the area can also be arranged on mountain bikes with support wagon and food included. This must be prearranged during your reservation process and at least two weeks prior to your arrival.